For more than 165 years, our partners at Blodgett have provided foodservice equipment that helps directors provide nutritious meals for their students. And in Florida, more than 60 percent of schools use Blodgett. From convection ovens to hydrovection and from combi units to ventless, Blodgett's technology allows K-12 schools to select the right type of equipment to serve their desired menus in the space provided. In particular, Blodgett provides solutions that can help in high volume operations such as Florida schools. Consider their roll-in configurations that can help districts meet some of their high-production challenges. Convection roll-in configurations are designed for maximum production and transportation. They are the only roll-in ovens in the industry that allow for easy loading and unloading of the top oven unit without interfering with the cooking process in the lower unit. During manufacturing, full-size Blodgett ovens receive slight modifications to create the roll-in models. Instead of traditional racks and rack guides, stainless steel tracks are mounted on the bottom interior of the ovens, and a dock-and-lock mechanism is added to ensure safe transportation. In terms of operation, it's easy. 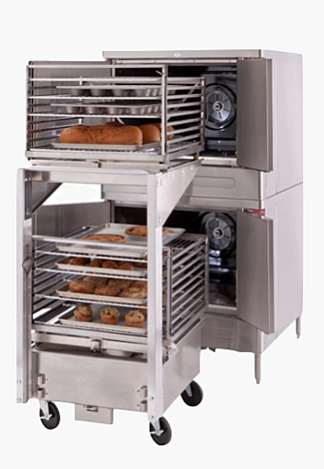 Just roll all all your product into the oven, and then select one of a variety of transport cart options, roll-in pan racks, or basket dollies that fits the goals of your operation. Curious to see how roll-in convection can help your Florida school cafeteria? Schedule some time to talk through some cost-effective foodservice equipment solutions with Eaton Marketing.